One of the purposes of the Chinese Lunar New Year is to provide the people with joy and easily digested movie entertainment. Therefore, the stars all turn up in mostly romantic comedies that make millions at the box office. Good for them, good for Hong Kong's economy but not good if you're after actual quality filmmaking. Those are the rules and I accept that. 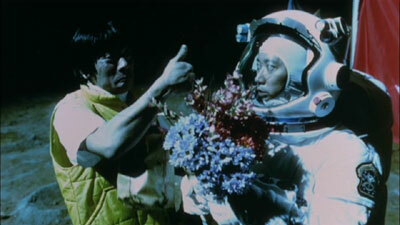 However the star filled Fantasia, Wai Ka-Fai's first solo directing gig since the wonderfully manic Too Many Ways To Be No.1, seemed to have one goal; to ACTUALLY provide something akin to great fun. Something few movies at that time of year or any time of year even come near to achieving. You can tap into the 80s era of Hong Kong cinema and find fun aspects, even the 90s, but undoubtedly director/producer/co-writer Wai Ka-Fai wanted to put on a colorful show and what better way than to give us a movie concentrating on icons of 1970s Hong Kong cinema, most notably the Hui brothers. Despite my attempt at a plot synopsis, Fantasia really is a lot like that famous quote from Seinfeld; "It's a show about nothing!" But if that worked for Michael Hui when directing comedy classics such as The Private Eyes and Security Unlimited, it can work for Wai Ka-Fai as well, right? You bet! Together with Johnnie To, Wai is one of the premier creative forces at Milkyway but when directing separately, they have shown two different, very distinguishable styles. Johnnie favors quietness, subtlety, understated nature to his films and Wai have primarily so far gone for the completely insane, fast paced route, most evident in the mentioned Too Many Ways To Be No.1 (also starring Lau Ching Wan and Francis Ng). How unlikely it may seem for you when watching Fantasia, proceedings and atmosphere are at least 10 times calmer compared to that film but overall it presents a relentlessly fast paced and insanely funny plotless ride. In actuality, Wai has remade The Private Eyes to a large extent and added touches of his with references to Security Unlimited, Aces Go Places, Jurassic Park and the Harry Potter movies. Since he's choosen the former film as his main palette, it also means that the entire movie really just is a series of skits barely strung together by a main plot device but we're talking very barely here. It's useless to compile a list of what the highlights are in this film because, especially in the first half, every scenario is a triumph in the way it references the previous films by Michael Hui and the way Wai himself adds elements (the CGI creature Bug being one such noticeable element). The movie ultimately belongs to Lau Ching Wan and Francis Ng, playing characters or rather the screen personas of Michael Hui and Sek Kin (the real Sek Kin was the villain in The Private Eyes) respectively. If there ever was a time in my review career that I had to use the word rock, it's now! These veteran actors absolutely rock and Lau as the bullying character of Michael, absolutely nails his impression of Michael Hui. Lau has good comedic instincts, as seen in La Brassiere, but that he was going to be able to come this close to the great timing of Michael Hui, I could never have imagined. You're in for a treat. That leads to a scene that should be discussed as it connects to these two men's performances. I'll have you know that the Johnnie To & Wai Ka-Fai directed Lunar New Year comedy of 2002, Fat Choi Spirit made me downright angry because it was easily digested filmmaking at its worst and all that Mahjong playing didn't do much to enhance the experience for me either. Now, I still don't know the game of mahjong but Fantasia gives us a fantastic scene involving that. Michael has, unbeknownst, to him been given luck in mahjong by Bobo and trying to avoid winning too much, he discards the tiles, mainly in his mouth while Kin is threatening him with death because he obviously thinks he's cheating. Lau lives perfectly up to the trademark Hui reacting in this very painful scene while Francis, mugging so much in this film he might pop any minute, in a good way, simply put is hysterical here (and for most of the film). One other scene that threatened to fall flat is actually Louis Koo's big Bruce Lee scene. For most of the time, it's not very well executed and Koo isn't as well in tune with Bruce as Sammo Hung was in Enter The Fat Dragon for instance. What saves this scene and makes it one of the most memorable in the film is an unexpected twist that further solidifies Fantasia's entertainment factor. The filmmakers seem to run out of the steam for a few minutes towards the middle though and no wonder, neither audiences or the makers can sustain that energy forever. Rest of the star cast do well, especially Jordan Chan, doing the Ricky Hui character from The Private Eyes, as Fugu. Ricky was always the underdog in these films but incredibly likable because of it and Jordan brings that nicely to his performance. An almost unrecognizable Cecilia Cheung I would have to say provides what she should but is not nearly as memorable. Hard to shine though especially when you're acting against Ng and Lau. Louis Koo stands somewhere in the middle also but displays good signs of that silly energy needed. Even The Twins (Gillian Chung and Charlene Choi) manages to create laughs in their attempts at emulating Kin. Yes, much of this film is about imitation and exaggeration but as said, it wouldn't be the great experience it is without it. Also appearing is Eric Kot, Cheung Tat-Ming, Christy Chung, Wong You Nam and a surprise cameo by the end by none other than...come on, that you can figure that out by yourself! Let's just say that Lau Ching Wan's work gets full respect when this moment occurs. Even without beforehand knowledge of the movies it references, Fantasia should be very enjoyable but do yourself a favour anyway and familiarize yourself with The Private Eyes first (and even Security Unlimited). Then you'll fully appreciate this wonderfully entertaining and fun Lunar New Year comedy. It brings back an energy to these films akin to the New year's efforts such as Eighth Happiness while standing on its own two feet despite being one big imitation. It is a movie about absolutely nothing and I've never had a more easier time to summarize it all despite that. What great fun! Mei Ah's 1.78:1 framed anamorphic presentation only suffers from some light damage on the print but showcases the eye popping colours of this show very well. The Cantonese Dolby Digital 5.1 track mostly livens up the front stage and does so fairly well. One wish it had a little bit more dynamic but this draws you in to a good degree still. Cantonese DTS 5.1 and Mandarin 5.1 tracks are also available. The English subtitles presented no problems whatsoever and only a slight mistime in one dialogue scene was the only error I could spot. Traditional and simplified Chinese subtitles are also included. Mei Ah have actually provided a little bit more special features than usual, starting with the making of (7 minutes, 49 seconds). It only comes with burned in Chinese subtitles so little here is of interest for non-Cantonese speakers. The behind the scenes footage of the kitchen fight, with the stand in for the CGI character of Bug is fun to see though as well as the cast working with the action directors but the program as a whole, is a one watch show. The MTV (1 minute, 53 seconds) is less of a music video and more a reel of movie clips intercut with the actors "singing" along to theme song of the film. The brief Outtakes Footage (1 minute, 2 second) is fun while it lasts, especially to see poor Lau Ching Wan do extended takes of Bruce Lee war cries and handling sausage chucks at the same time. Best Buy section holds trailers for The Legendary La Roise Noire 92 and the animated feature The Butterfly Lovers. Here's for the big revelation and a sure sign that armageddon is upon us. Mei Ah's Data Bank section actually has content in it outside of the plot synopsis screen and cast & crew listing! Interview of main cast (7 minutes), again has Chinese subtitles only. In the style of the making of, Lau Ching Wan, Cecilia Cheung, Louis Koo, Francis Ng, Jordan Chan, Gillian Chung & Charlene Choi and Christy Chung are interviewed respectively in combination with movie clips and behind the scenes footage. Again, the shots of Gillian and Charlene working with the action choreographers is the only noteworthy bit here that us non-Cantonese speakers can appreciate. Interview of director (56 seconds) Obviously over before it stars, short interview bites and Wai Ka-Fai working on set can be seen in this segment. Interview of singer (24 seconds) rounds off the Data Bank section. Finally, the trailer for Fantasia ends the special features section. To get English subtitles for extras is not a given on Hong Kong dvd's but Mei Ah including a little bit more than usual is noteworthy. They haven't lived up to the great initiative on the Men Suddenly In Black set (the Cantonese audio commentary came with English subtitles) but their current wonderful remastering of their back catalogue is enough to forgive the inclusion of Chinese subtitles only on this, a release of a recent film.